Project Crane Island Retreat, Minnetrista, Minn.
STONEWORK Landscape Renovations, Afton, Minn. 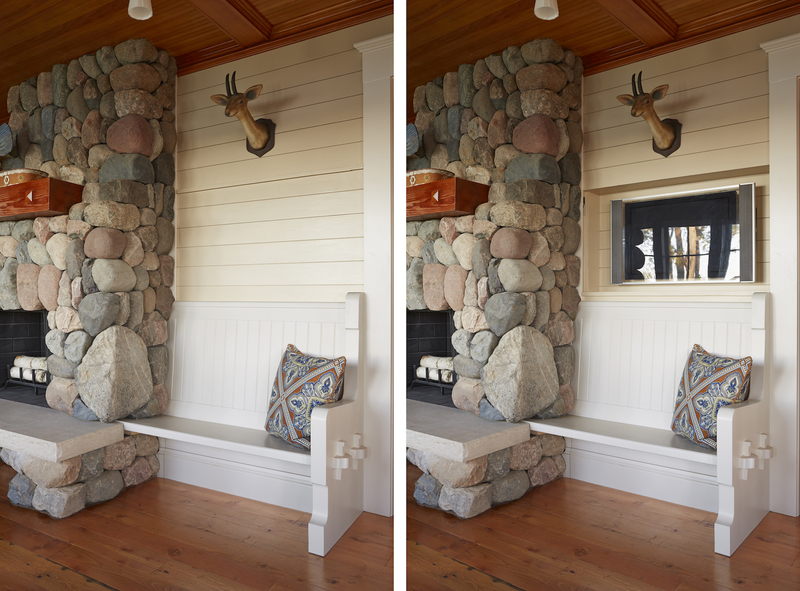 When designing a new home that’s meant to look and feel like a 1910 lakeside cottage, David Heide Design Studio (DHDS) created a stone hearth as the heart of the structure. For this weekend retreat on Crane Island, in Minnetrista, Minn., Mark Nelson, architect at DHDS, says, “One of the primary goals for the house was to have a meaningful fireplace in the living space.” Thanks to traditional touches and mindfulness of what came before, the new home fits right in with its century-old forebears. Stone fireplaces were common in the early 20th century, making the decision of which materials to use an easy one, though transporting the stone to the island and achieving the perfect dry stack, tight-joint look was not without its challenges. Integrated into the zero-clearance fireplace is a mantle created from reclaimed fir that was shellacked to bring out the wood’s natural grain and luster. Bookending the stone fireplace is a column made from the body of a full pine tree and a bench, custom-designed and built into the stonework. 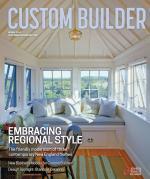 “The bench harks back to the idea of an inglenook,” Nelson says, invoking the cozy hearthside seating common to late 19th- and early 20th-century homes. However, modern amenities do exist in this traditional home. In fact, one such modern feature is concealed beside the hearth: A television is hidden above the bench (photo, left), in a double wall. The panel that conceals it is operated by pulleys and weights that work like an old double-hung window. Comments on: "Details: Stealth Modern"